After 260 Malt Missions, is my palate tired or my tastes more refined? How about after 100 whiskies in a single day (yes, spitting... for most of them)? Yesterday was unlike any day I have ever experienced, and experience was something that the likes of Mario G and Sukhinder S continuously reminded me that I had in short supply. From a 17-flight judging panel of 54 whiskies in the afternoon to a seemingly never-ending night of everything from Compass Box's original Hedonism through Scott's Selection Longmorn-Glenlivet 1971 to Samaroli's Ardbeg 1973 (Fragments of Scotland) it was a long day that tried my nose and palate in ways I never thought possible. It would be unfair to call it hard work, to the reader it would no-doubt sound like a backhanded boast, but what I am acknowledging is my humility, ALL OF OUR necessary humility in the face of this ever-generous spirit. Additionally, I have yet more evidence that I have no justification to 'score' whiskies outside of blind tasting competitions where any score is only relative against its competitor. I have so much more to say about Thursday February 28, 2008, but I haven't the words... or more importantly, the time. Port Ellen was founded in 1825, closed after 1929 only to be reopened in 1967 (after some modernisation and renovation), silenced in 1983, and fatally closed in 1987. Today the distillery provides malted barley to Caol Ila and Lagavulin (and others?). The world of whisky connoisseurs have mourned this lost distillery and still sing its praises with every sip supped from finite supplies. Big thanks to TF for bringing over the bottle and thanks to DB and RA for inviting me for the day, SS, MG, JG, GG, and more for the unforgettable night. Cheers and happy leap year! Salty, slightly rubbery, and spiced with sherry. Smoked mussels, salt and dried fruits. Damp, humid, dusty, like desperately mid-night drinking from that glass of water that has been sitting beside your bed since last week. Moldy tobacco, sherry, and fish. Funky and odd but incredibly inviting. Waves of smoke throughout. Soft red delicious apples, bruised. Sherry, pepper. A new fire, paper and shreds of bark. Very burnt, charred, but coated in cake icing. Today the distillery provides malted barley to Caol Ila and Lagavulin (and others?). I assume you mean the (Diageo owned) Port Ellen Maltings, which take up part of the former distillery buildings? Some of the bonded warehouses are still in use with the remaining stock. Some of the old buildings have been torn down and some are used for various purposes by the maltings. To my knowledge they supply all the distilleries on Islay (and Jura). Only Laphroaig, Bowmore and Kilchoman do some of it themselves, but they also have to buy in some of it. I have a vague memory reading somewhere that Kilchoman is doing about 40% themselves and get the rest done in Port Ellen. Not sure about the other two. Yup. I write quickly. Thanks for the clarification and information. I`ve just tasted the P.E., but not the gym bit for sure, and the smoked mussels as description are just brilliant. Not sure about the price. But it worth a sip. It is okay at least. See you soon. 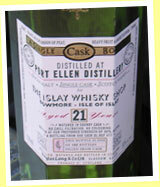 A bottle of the new OMC Port Ellen bottling - 25 yo 1982/2008 - goes for about 100 quid. The price for this one should be similar.